I have been collecting fountain pens for twelve, maybe thirteen years now and it has been a real journey. 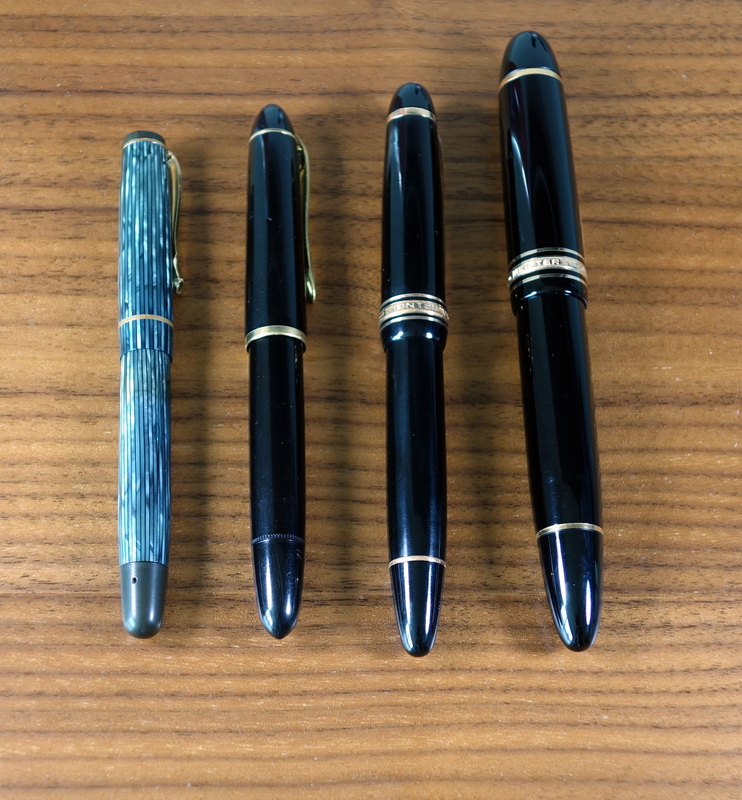 I have a lot of fountain pens from the early 1900s to present day and for me my favorite era is the late 1940s to the late 1950s. I believe this period was the culmination of fountain pen technology combined with the best quality nibs and the most beautiful celluloid bodies. During this time in Europe the major manufacturers were moving to piston fillers that are more or less the same mechanism that we have in modern day fountain pens. Back then the composition of gold nibs was different…I don’t know what specifically has changed but in general the nibs were softer and springier than the gold nibs on modern pens. Manufacturers like Montblanc and OMAS were at their innovative peak during this period and I would argue that we have seen very little innovation from 60s to present day (apart from some smaller newer manufacturers). Okay, if you are still here and I haven’t bored you to death, Soennecken: they went out of business in the late 1960s but they were a competitor to Montblanc and Pelikan. They made lots of colorful celluloid pens in various patterns and in my opinion were of equal (or superior) quality to their German rivals. The 103 is my first Soennecken. It is a ladies pen made in the early 1950s specifically for the Swiss market. Being a ladies model it was significantly less expensive than the highly desirable 111 Extra (MB 149 size) and 111 Superior (MB 146 size) flagship Soenneckens. The 103 has a beautiful green striped celluloid body with a hard rubber finial and blind cap (piston knob). Being on of the earlier models the finial is pointed instead of the rounded dome shape the later models had. The gold plated clip is in excellent shape and reads “SOENNECKEN” with the “O” overlapping the “S”. The ring on the cap has a good amount of brassing and sadly doesn’t match the gold color of the clip as well as it should. 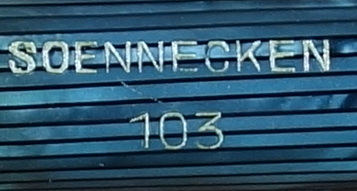 The body has “SOENNECKEN 103” imprinted on the body and all the letters are still white and crisp. There is a little ink window that is quite clean for its age. No ambering like I see on a lot of old ink windows. The nib is quite small and while it seems proportional to the body it is a bit narrow for my tastes. It is a pretty plain nib with an overlapping “S” and “O” as the only design other than “14K – 585”. The ebonite feed is cut nice and flat; it looks very similar to an OMAS feed. The 103 is a great looking little pen. This is a 60+ year old pen and everything on it fits tight and as it should. The 103 is a handmade pen. There are no seams like you would find on most mass-produced plastic pens today. I also see no celluloid shrinkage like I see on a lot of pens from this era. The piston seal is cork (as was common at the time) and can dry out if stored dry for a long period of time…otherwise it should be good to go another 60 years. It is a stout little pen that stands up well against Montblancs and Pelikans of the era. The little 103 measures 4.6” capped, 4.4” uncapped, 5.75” posted and weighs 16.3 grams. It’s the smallest vintage pen I own. I have smaller hands and I have been able to write a few pages pretty comfortably. Even though it is lighter weight it doesn’t feel cheap in hand. Is it my ideal size for a pen? Certainly not, but the combination of light weight and a nice sized grip section all allow the little 103 to work as comfortably as many larger pens. The little 14kt gold nib performs like a champ. It’s a very soft and springy fine. There is not a lot of line variation like some of my other pens from this era but it has the same wonderful feel that I have come to love. No issues with skipping or hard starting. 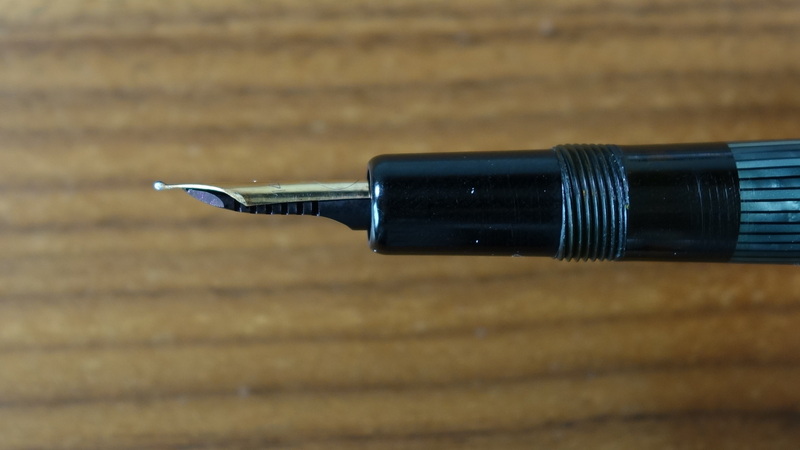 There is a sweet spot to the nib but it is easy to find. I used the 103 as my daily writer for two weeks straight and it proved to be a real workhorse. The 103 has a standard piston filling system and not the famous Soennecken “click” mechanism that is more prone to breaking. As I mentioned above, it does have a cork seal, which can be a weak point if you store your pens for a long time. My 103 was completely overhauled and has a new cork. The 103 holds a good amount of ink for such a small pen. Even though I went for a cheaper model, Soenneckens are not cheap pens in general. The condition and the color and pattern of the celluloid all affect the price. I have seen 103s go for $250+ but in my opinion that is on the high side. I think the sweet spot for a pen 103 with a nice striped celluloid body should be around $140-$175. I paid around $170 for my restored 103 and while I admit it’s a lot of money for a small pen, I think it’s worth every penny. I purchased the 103 to see if Soennecken should have a place in my collection. I figured if I didn’t like it I wouldn’t be out too much money. As you can tell, I did like it and I am now on the hunt for a very nice 111 Superior or 111 Extra. It’s a winner with beautiful looks and full-sized performance in a small package. 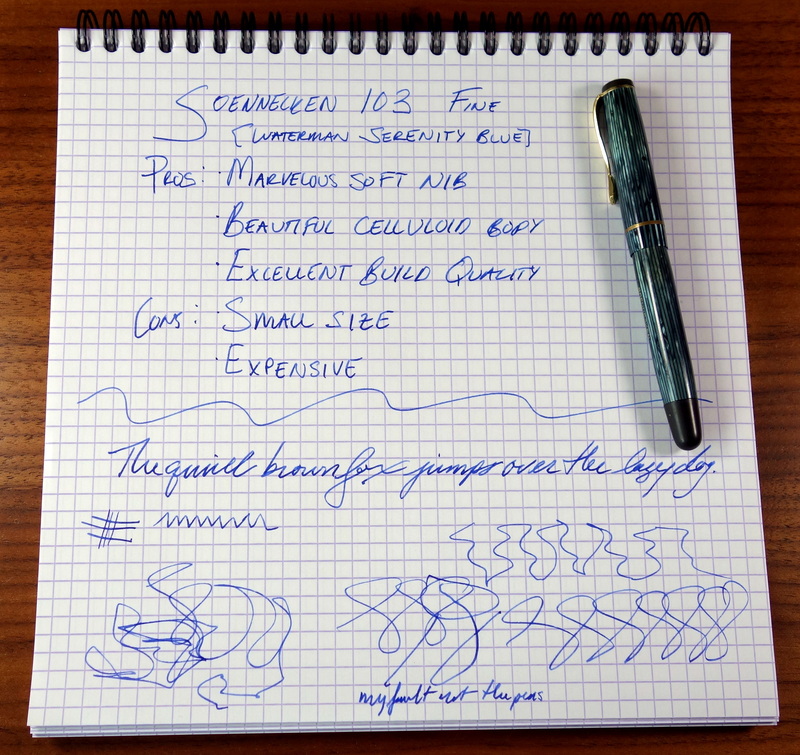 One thing to note: If you want a bigger Soennecken you can add a couple hundred dollars for each pen size you go up. I think that 111 Extra (MB 149 sized pen) is a value at $900-$1,100 in good condition. A Montblanc 149 from the early 50s is worth around $2,000 and a 139 from the late 40s is worth $3,000+. I just point this out because 1950s Soenneckens are pretty close price-wise with 1950s Montblancs until you get to oversized pens where the Montblancs start getting crazy expensive.